Ride your bike to St. George's to enjoy "Cycling Music" in the sunshine. William Berry in his best cycling clothes. Clarion has put on successful Christmas concerts for years, so William Berry — composer and guiding light of the brass ensemble — thought to himself, “Why not have a summer solstice concert?” But with minimal advertising in advance of this Sunday’s brass-band-on-the-greensward concert, how many people does Berry expect to show up? “Well, I expect the entire band to be there,” he says, deadpan. But there’s room for only 240 vehicles in the St. George’s School parking lot. And since Berry is an avid cyclist himself, that’s why there’s a kind of surcharge for driving your car out to where Louis Davenport had his summer home, out on the St. George’s campus. 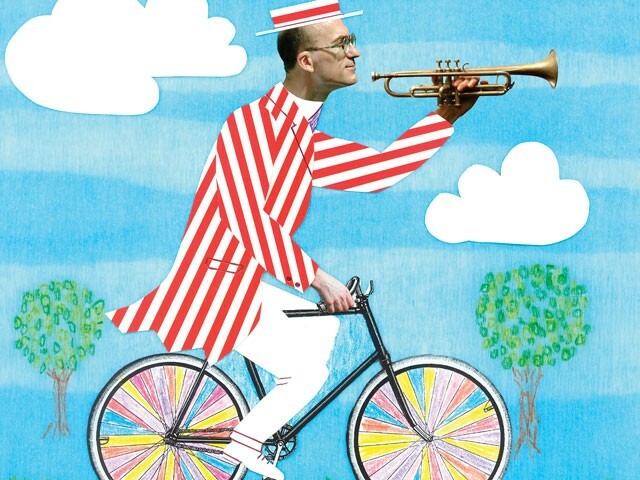 The featured work in the first half of Sunday’s afternoon concert will be “Cycling Music” — Berry’s 2004 concerto for trumpet and brass choir — which he describes as “light summer music, not heavy listening.” It’s written, as are all of Berry’s original compositions for Clarion, for 12 brass players and one percussionist, to be conducted by Robert Spittal of Gonzaga’s music department. In addition to “Cycling Music,” the first half of Saturday’s program will include “more traditional and serious” music, Berry says, like “Nimrod” from Sir Edward Elgar’s Enigma Variations, in addition to a chorus (“With cat-like tread”) from The Pirates of Penzance by Gilbert and Sullivan, and the “March to the Scaffold” from Hector Berlioz’s Symphonie fantastique. Clarion Brass presents a “Picnic Concert” on Sunday, June 27, at 2 pm at St. George’s School, 2929 W. Waikiki Rd. (1.5 miles west of the Spokane Country Club entrance). (On the lawn, but — in case of rain — inside Metters Gym.) Tickets: $10 (if you arrive on foot, by bicycle, or in a kayak); $20, if by car ($10 for each passenger).